This interview with Viet Thanh Nguyen for the New Orleans Review was conducted by Elizabeth Sulis Kim. 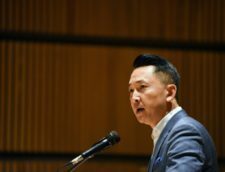 Viet Thanh Nguyen, the Vietnamese-American author and Professor of English and American Studies and Ethnicity at the University of Southern California, was a recipient of a MacArthur “Genius” Grant in 2017. His works include The Sympathizer, which was awarded the Pulitzer Prize for fiction in 2016; the short-story collection The Refugees; and Nothing Ever Dies: Vietnam and the Memory of War. His most recent book is The Displaced: Refugee Writers on Refugee Lives. This interview was conducted in English by phone on April 20, 2018. As a child, I think I just wanted to be a writer because I derived pleasure from it; it was fun. 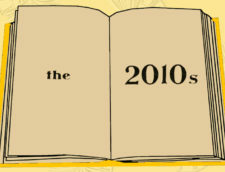 My first memory of it was writing an illustrated book when I was eight years old. In college I started paying attention to the art of writing and thinking about writing as something that was important. I wanted to tell stories about what it meant to be Vietnamese—and Vietnamese-American—that dealt with the Vietnam War. And at that time in college, in the late ‘80s, early ‘90s, there weren’t that many stories written by people like me about those kind of issues—so I felt I was becoming a part of traditions—of minority writing and colonial writing—that dealt with similar issues. So those are the two things that have driven me I think: one, this conviction that writing can be important for social and political reasons, and the other, that writing can be important for artistic reasons and for the pleasure that a writer can derive from the act of writing itself. So do you see writing as a form of activism? Writing can be a form of activism—it certainly seems to me that my writing is. But most American writers probably do not think of their writing as a kind of activism. And it shouldn’t have to be—I don’t think we can impose that on writers—but it can be. I think for the many writers, the ones I admire—it is. And it depends on the writing I engage in—the op-ed or non-fiction, the academic work. But when it comes to fiction, which is what most people talk about, I do think the simple act of writing about people or events or cultures that are not often talked about constitutes already a basic kind of activism, one that can be elevated to something much more sophisticated. A common theme in your fiction is duality. To what extent are The Refugees and The Sympathizerautobiographical? I think that my writing is mostly not autobiographical. I’ve written only one explicitly autobiographical short story, “War Years” in The Refugees. I think that’s because I was so uncomfortable with talking about myself; that’s something I’ve become more comfortable with recently, so you’ll see more of my autobiography in op-eds or in my non-fiction book, Nothing Ever Dies. For the most part, the way that the personal part of me is expressed in fiction is more through thematic issues. The narrator of The Sympathizer, for example, is not me, for the most part, but his worldview is mine, just greatly exaggerated. We know from the very beginning that he’s “a man of two faces and a man of two minds,” and that’s pretty much me. I think ever since I became conscious of myself as someone who’s not just an American but also someone who’s Vietnamese—and who’s seen that way by other people—I was aware that I had a sort of duality. I was a little bit uncomfortable around generic Americans, and I was a little bit uncomfortable around Vietnamese people. And that sense of duality I think is universal—I think many of us have felt at some time out of place. The difference I think is that when you are a minority, however you choose to define that, the sense of duality is perpetual. You usually feel that way, and when you don’t feel that way, you feel at home; it feels incredible. But if you’re part of a majority and you usually feel at home, you only occasionally feel that sense of duality. Has your work in any way been influenced by Vietnamese art, literature, or culture in general? I grew up as an American reading English literature—basically Anglophone, American and European literature in translation. I actually had almost no exposure to Vietnamese literature. I had to actively seek it out in college. And really the kind of Vietnamese culture that I was exposed to growing up was music, for example. And so I think it was actually more the music and poetry that was popular in the Vietnamese community—because poetry was actually important there—that influenced me most. And you know, the sentiments were more romantic, melancholic; these are the emotions I associate with Vietnamese refugee culture, as expressed in poetry and music. The literature itself, which I managed to get to in college, was what was available in translation, and it was mostly about the war. So it wasn’t that influential on me. My major influences still remain the European, American and post-colonial traditions, but what I’ve gotten out of Vietnamese literature is the emphasis on centering experiences—the memory, the history and the suffering of Vietnamese people—which is mostly what Vietnamese literature that I’ve read is about. So exposing yourself to Vietnamese literature was a personal choice? It had to be a choice. The literature I was most exposed to that was Vietnamese was the Vietnamese version of the Bible. I’m not a devout Catholic, but my parents are, and they raised me that way. Their idea of teaching me the Vietnamese language was to send me to Vietnamese Bible school. So to actively seek out Vietnamese literature meant going in a different direction from that. I will say that the one Vietnamese book that had a big formal influence on me was The Sorrow of War, by Bảo Ninh, which is the best-known novel about the Vietnamese war experience, in this case told by a North Vietnamese veteran. It’s a great novel; it’s a great war novel period. Its formal innovations—which deal with how to talk about war, how to talk about trauma, how to talk about memory—all those things were actually quite inspirational for me as I tried to think about how The Sympathizer would deal with those same issues. Would you go so far as to say The Sorrow of War was the book which inspired you to write The Sympathizer? That novel didn’t inspire me to write The Sympathizer. It came out in the late 1980s, I think, and I probably read it by the early 1990s. No, it didn’t inspire me. But it was part of a body of war literature that came out of Vietnam that framed my understanding of the war. The closest American comparison, for example, would be Tim O’Brien. O’Brien and all those other American writers of the war were part of my reading. The Sympathizer, to the extent it was inspired by any of those books, is my response to them. So The Sympathizer is responding to Bảo Ninh—and it’s responding to Tim O’Brien—but its inspiration is actually just that general sense of rage or anger at the erasure of Vietnamese experiences, for the most part, in the Western imagination, and also this desire to tell an entertaining story. The more direct inspirations would be people like John le Carré and Graham Greene. Greene, for example, is probably the one writer who embodies all these things I’m talking about—both in terms of inspiring me, because I admire his writing in general, but also infuriating me, because I think The Quiet American, one of the earliest examples of Anglo literature about Vietnam, is also pretty enraging when you read it. So I’m both reacting to and inspired by people like Greene. You often speak of anger. Is that something you’ve always felt, or did it rub off on you from your family or the Vietnamese community? My parents were never angry about the past and what had happened to them. I think they were stoic; the suffering they stoically endured was very influential on me. I think my anger does emerge from my response to that—out of my response to what had happened to them—and the silences that came out of it. And from that experience of being a Vietnamese refugee. Growing up in the United States, I eventually realized that I was also a Vietnamese-American, or an Asian-American, and that realization came with a lot of anger because even growing up in a relatively multicultural, liberal place like California, that history was erased. All through college, I heard about the things that had happened to Asian immigrants and Asian-Americans since the 19th century, and that was enraging. But a lot of those things had been actively suppressed from American history. And then certainly, growing up in the Vietnamese refugee community, even if my parents weren’t angry, at least not explicitly, there were a lot of angry Vietnamese refugees, who either said so or who expressed their rage in inarticulate ways: through violence, through all the kinds of things that traumatized people engage in. I don’t think I was angry when I was young. I got angry the moment I stepped onto the college campus at Berkeley. That’s where the anger was unleashed. It was there inside of me, without my being able to articulate or understand it. Trying to give words to it in college was what really allowed the anger to take shape—and eventually be realized in the form of a novel. You were four when you left Vietnam. Do you remember anything of the country? No, just fragments. It’s the images I can recall—whether they actually happened or not, I’m not sure. I think real memory, in the sense of narrative memory, begins when I reach the refugee camp in the United States and I’m taken away from my parents at four years of age to live with a white American sponsor family in Pennsylvania. That’s really where my memories begin. How did your family end up in California? My family was sent by the American government to Fort Indiantown Gap, one of four refugee camps set up to receive Vietnamese refugees. So we settled outside of that fort in Pennsylvania and remained there for three years. In 1978 my parents found California a much more attractive place—which is true—and so we moved to San Jose in northern California, near San Francisco. My parents had a good friend who had gone there first and reported that there were economic opportunities and good weather, so we followed. I lived in San Jose from 1978-1988, and I think that decade was the formative decade for me, in terms of turning me into the angry person I am, hoping to become a writer. What were your parents doing in San Jose at the time? They opened perhaps the second Vietnamese grocery store in San Jose. It was a very hard existence—all the stereotypes about refugee shopkeepers struggling to achieve the American dream were there for my parents—that’s what I would witness growing up. I remember, when I was 10 or 11, walking down the street to my parents’ store, seeing a sign in another store window that said, “Another American, driven out of business by the Vietnamese.” So that was an early indicator to me that we were not completely welcome in this city—or this country. That was all a part of what would eventually turn me into a writer. Did that inspire you to pursue ethnic studies alongside English literature as a double major? I started off as an English major because I wanted to have a lot of time to read, and I didn’t know what else to do with my life. I thought it would be fun to study literature, but I didn’t think I could make a living out of it. My parents were working 12-14 hours days in the grocery store, so there was really no way I could go home and say to them, “Hey, I want to spend the rest of my life studying the Romantic poets”—even though I enjoyed that. So when I went to Berkeley, I discovered something called Ethnic Studies, the study of racial ethnic minorities in the United States. And that just lit a fuse, because part of that major was also studying literature written by people of color in this country. Finally I could connect all the dots. Finally I could connect my love for literature and my unadulterated enjoyment in reading books and writing—which seemed to me to have no practical purpose—with the social and political importance of literature for minorities and for people of color in the United States, and also for colonized peoples elsewhere. I could see that actually the study of literature, the writing of literature, was not just beautiful and pleasurable; it was also meaningful in the political sense. And that’s what allowed me to dare to become an academic who could study these things but also a writer who could write about these things—and to think that my writing was not simply something for me personally for my own enjoyment but also something for a collective good. You emphasize your love of reading. Which books, genres and authors did you grow up with and which stayed with you? There’s a lot. When I was a kid, what got me going were some of the classics, you know, like Curious Georgeand Tintin, both of which I find problematic talking about today. Nevertheless, they were powerful for me, and I reread them now with my son. And then going through elementary school and high school, it was a lot of fantasy, a lot of science fiction—writers like Frank Herbert and Robert Heinlein, Anna McCaffrey. When I got to college, it was more writers of the minority and post-colonial tradition, people like Toni Morrison, Ralph Ellison, and Maxine Hong Kingston. They still remain important figures for me. And then when it came to preparing to do stuff like writing The Sympathizer, I read Joseph Heller. I would read authors that I really thought I needed to read like Louis-Ferdinand Céline—he remained an important inspiration for that book. The last major writer who totally made it possible for me to write this book is a Portuguese writer named António Lobo Antunes, author of The Land at the End of the World. The experimentalism, density and sheer, harsh beauty of his language really triggered the voice of The Sympathizer. How did you come to write The Sympathizer? I’d just finished a draft of The Refugees, and my agent said he liked the collection of short stories, but in order to sell it to one of the major publishing houses in New York, I’d have to write a novel—and that we’d tried to sell both. So I said fine. I’d always wanted to write a novel, and that was my inspiration. I was very pragmatic, and I knew right away that I wanted to write a spy novel—a genre spy novel. I wanted it to be entertaining—I’d read a lot of spy novels—I like them a lot as a genre. But also spy novels are deeply political and deeply historical, usually. And I wanted to deal with those kinds of political and historical issues, so that’s how I wrote The Sympathizer. And of course, after I’d finished writing The Sympathizer, my agent sold the novel but didn’t sell the short story collection. So that plan didn’t quite work out. You’ve said in various interviews that you find writing hard—is that the craft of writing or coming up with ideas? I found writing The Refugees to be very, very hard—partly because I didn’t know what I was doing. Everything was hard; writing a sentence was hard, how to construct a story, how to edit, how to revise, how to end. It was all difficult. And of course, besides the act of writing, there’s the difficulty of publishing and the feeling of writing in isolation without recognition or hope. It’s all very difficult. The Sympathizer, ironically, even though it’s a much more difficult book to read than The Refugees, was much easier to write. So The Refugees took seventeen years, and The Sympathizer, which is twice as long, took a little over two years. The difficult part of writing The Sympathizer was probably not the technical stuff but the moments when I talked to an agent and I started to worry whether the book would sell or not. That was the most difficult part. How were The Sympathizer and The Refugees received in Vietnam? The Sympathizer, when it came out, was very well received, and Vietnamese people had heard about it and were intrigued. But it’s a literary novel. It didn’t have that much of an impact, I think, until it won the Pulitzer Prize. Then all Vietnamese people, here in the United States but also in Vietnam, suddenly started paying attention. It’s ironic that it took an American literary prize for the Vietnamese people to suddenly feel a huge amount of pride in that accomplishment, and that’s basically what the reaction has amounted to. 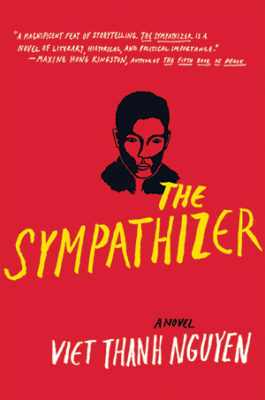 The difficulty, obviously, is that The Sympathizer is an unequivocally controversial novel in that it sets out to be critical of just about everybody—except the Pulitzer Prize committee—it’s critical of the South Vietnamese, for example, it’s critical of Vietnamese communists. In Vietnam there is still very active censorship and suppression of writers. So it was a real surprise to me when I was able to sell all three of my recent books to Vietnamese publishing houses—because all three are, to one degree or another, pretty critical. So the first test case was The Refugees, which just got published in Vietnamese. In Vietnam it’s a censored edition, with an entire short story removed from it, which happens to be “War Years,” the only autobiographical short story I’ve written. So there’s a separate overseas, Vietnamese-language edition, which is uncensored, where all the stories will appear. And I agreed to that censorship in Vietnam because I felt the short-story collection could still stand on its own, and I really wanted it to reach a Vietnamese audience there—and overseas as well. The translation of The Sympathizer has been finished, but it is now being reviewed by the appropriate government officials for approval for publication. That’s a much more serious task—they would basically have to remove the entire last quarter of the novel to remove any negative allusion to communism—and that can’t happen. So I don’t know what will happen with the publication of that book in Vietnam. Have you returned to the country since you left as a four year old in 1975? I returned in 2002—that was my first return. Between then and 2012, I visited about five or six times for about a year altogether so that I could study formal Vietnamese, travel the country, do research for my non-fiction book, Nothing Ever Dies: Vietnam and the Memory of War, and write. I was actually writing The Sympathizer on my last trip in 2012. Now I just want to wait and see if The Sympathizer will get published there and what the official government reaction will be. Because I don’t want to show up in the country and get turned back at the airport and sent home. That has happened before. One final question. What kind of projects do you have lined up for the near future? 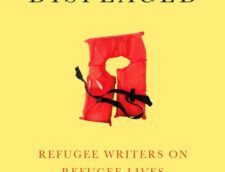 I just published a book called The Displaced, by refugee writers about refugee lives, that continues the work that is important to me in terms of advocating for refugees. In this case, not just in some kind of editorial way but in collecting seventeen writers who are also refugees and having them talk about very specific kinds of human experience that their communities have been through. And then the big writing project for me personally is the sequel to The Sympathizer, which I’m hopefully halfway through right now. Elizabeth Sulis Kim was born in Bath, England. She holds an MA (Hons) in Modern Languages from the University of Edinburgh and currently works as a freelance journalist. She has written for publications in the United Kingdom, South Korea, and the United States including The Guardian, Positive News, The Pool, HUCK, and The Millions. She currently lives between London and Buenos Aires.